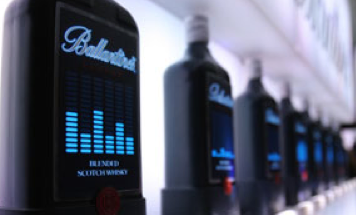 The Ballantine’s Finest is launching a new extremely creative self-illuminating bar bottle with scotch whiskey. The black bottle has a label with a blue graphic equalizer, which employs electroluminescent technology to glimmer in darkness. Now the bottle with the sound-sensitive label reacts to music in the bar like it is alive. 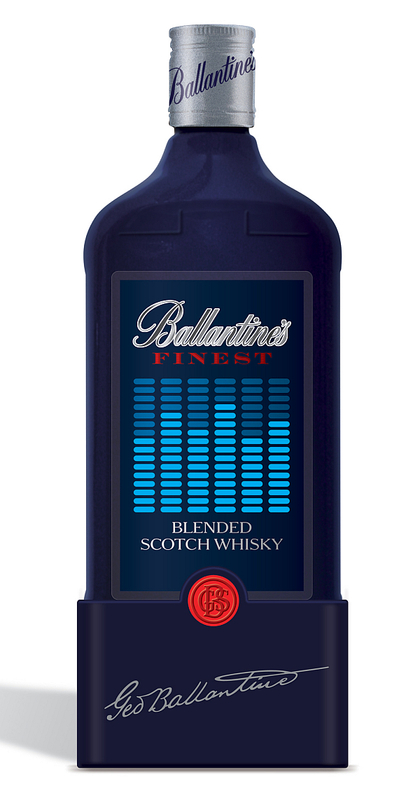 The innovative bottle, which can be used for display or pouring purposes, forms part of an on-trade-led initiative for Ballantine’s Finest, entitled ‘Listen to Your Beat’. Rolling out across bars and nightclubs in 35 key markets, the initiative is based on the idea that by listening to your own beat and following your own instincts, you will make choices that leave an impression on others. Created by London-based packaging agencyThe Core, the striking Ballantine’s Finest bottle was launched this earlier month and is already available in the on-trade in Germany. Reflecting a graphic equaliser, the dark blue spray coated bottle appears to react to the tonal quality of audio passing through it, by lighting up intermittently to create drama and increase back bar prominence. Powered by batteries or mains, 20,000 units have been made available, along with a range of additional electroluminescent POS materials including posters and t-shirts for staff. Created by London-based packaging agency The Core, the striking Ballantine’s Finest bottle was launched this earlier month and is already available in the on-trade in Germany. Reflecting a graphic equaliser, the dark blue spray coated bottle appears to react to the tonal quality of audio passing through it, by lighting up intermittently to create drama and increase back bar prominence. Powered by batteries or mains, 20,000 units have been made available, along with a range of additional electroluminescent POS materials including posters and t-shirts for staff. Posted in News and tagged alcohol drinks, Ballantine's, whisky. Bookmark the permalink. What an innovative idea. This a fabulously creative take on labelling – great graphics and a great thought behind it. A truly illuminating piece of design. I’m stay in Asia anyone can help me to get the item ? I stay in Asia anyone can help me to get the item?